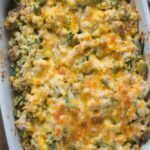 Scrambled Egg Ground Beef Casserole - Keto and Low Carb! 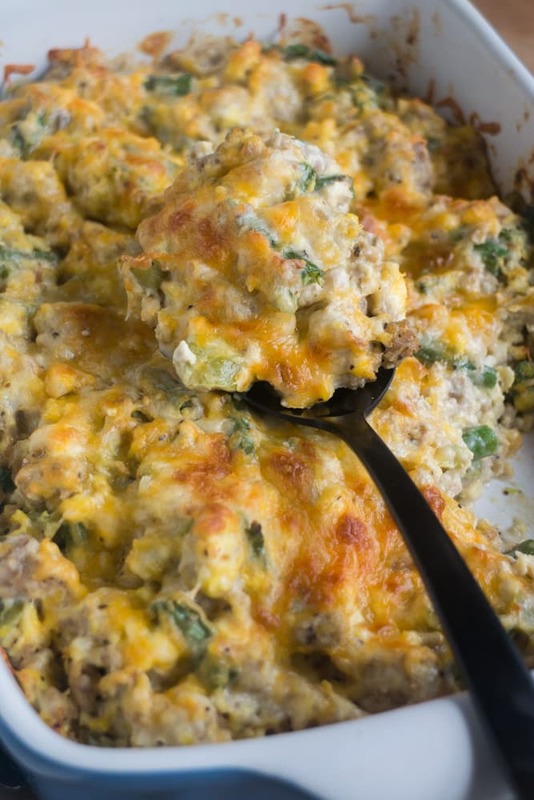 Alongside the scrambled eggs and ground beef, this casserole includes green beans and chopped peppers. 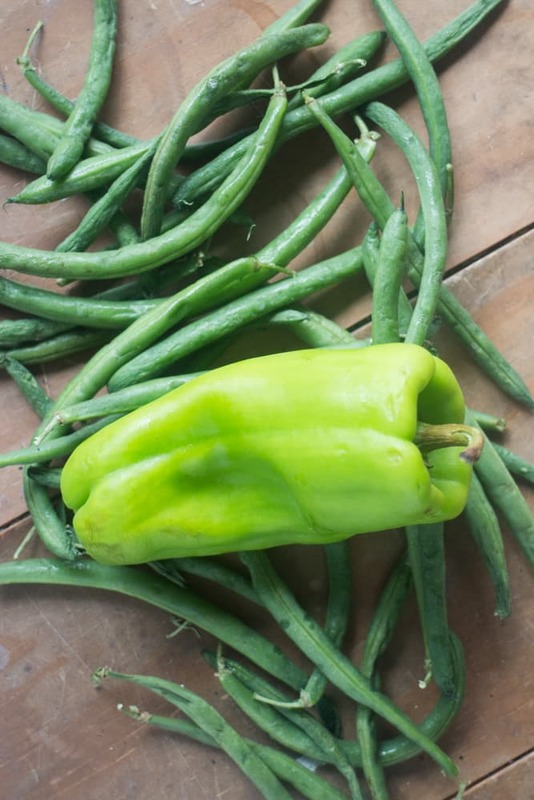 One cup of green beans has 6g net carbs, so they’re a great vegetable addition to this dish. 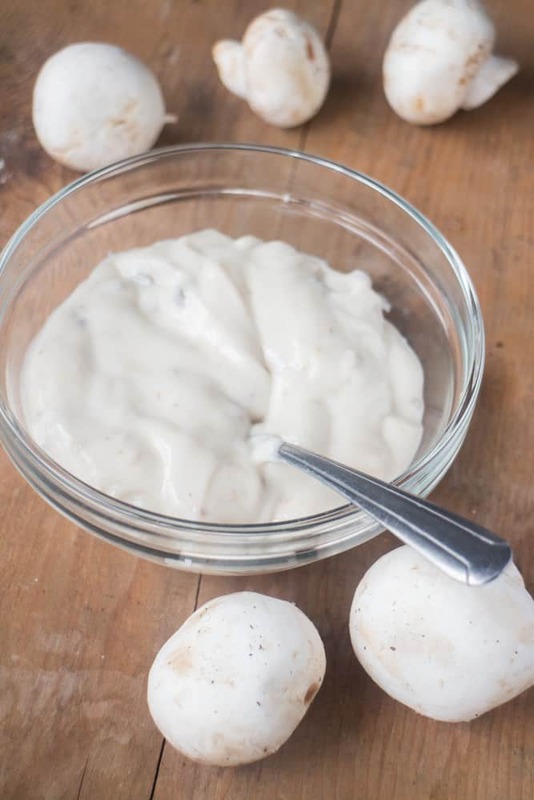 We’re going to make a homemade cream of mushroom soup that’s keto friendly. This is based on my favorite cream of mushroom soup recipe, but we’re using almond milk instead of regular milk. Homemade cream of mushroom soup is so easy to make you’ll never buy the canned version again! 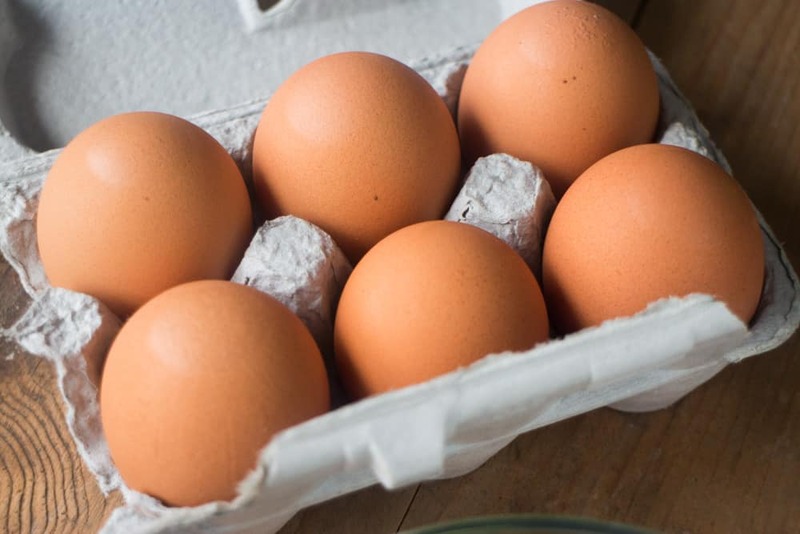 What recipe uses a lot of eggs? 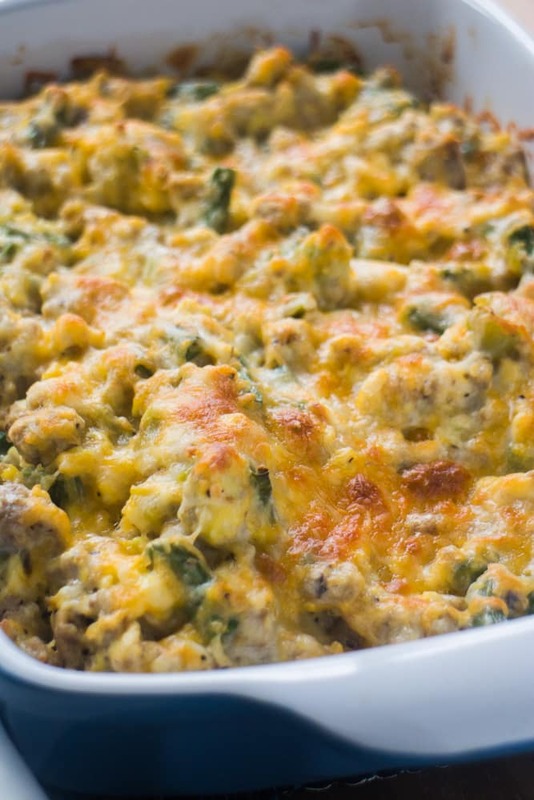 This casserole recipe calls for 6 scrambled eggs. I picked up these eggs from the farmers market last weekend, aren’t they beautiful? What recipe can I make with ground beef? You’re going to cook the ground beef, green beans and green pepper in a pan until the meat is browned. Then add your eggs into the pan and cook until scrambled and no longer runny. If you’re looking for more ground beef recipes try my Easy Ground Beef Chili too! 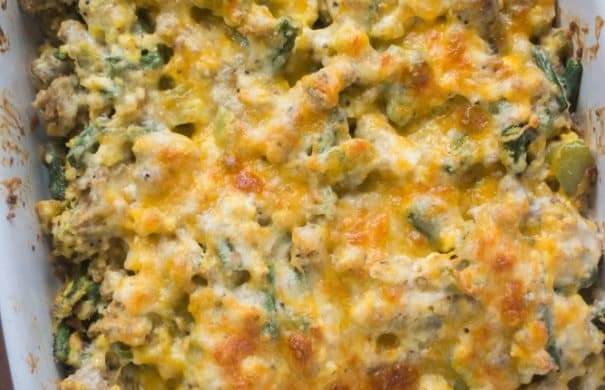 Pour mixture into a casserole dish and sprinkle shredded cheese on top. Into the oven it goes for 20 minutes. After 20 minutes set your oven to broil and bake for 2-3 more minutes or until the cheese is slightly browned (keep a eye on it!). And just like that you have a delicious Scrambled Egg and Ground Beef Casserole to serve for your family! If there’s any leftovers they’re delicious for the next day too! 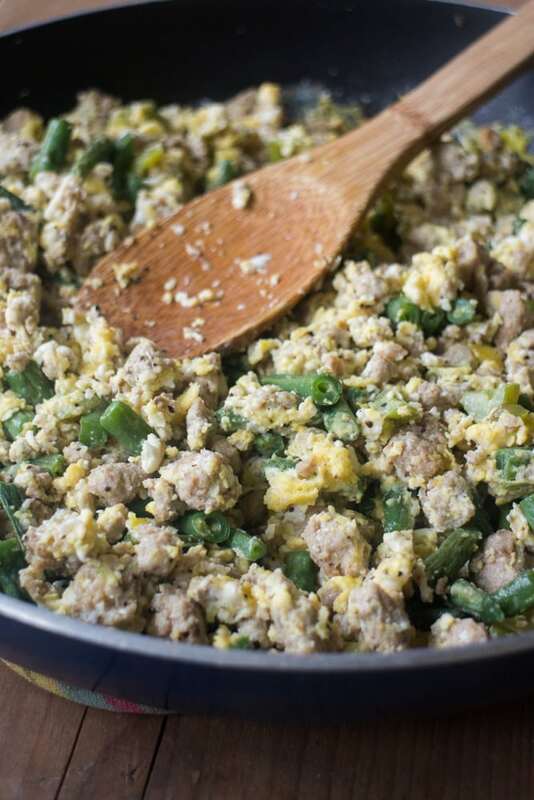 KETO Scrambled Egg and Ground Beef Casserole recipe that's easy to make! 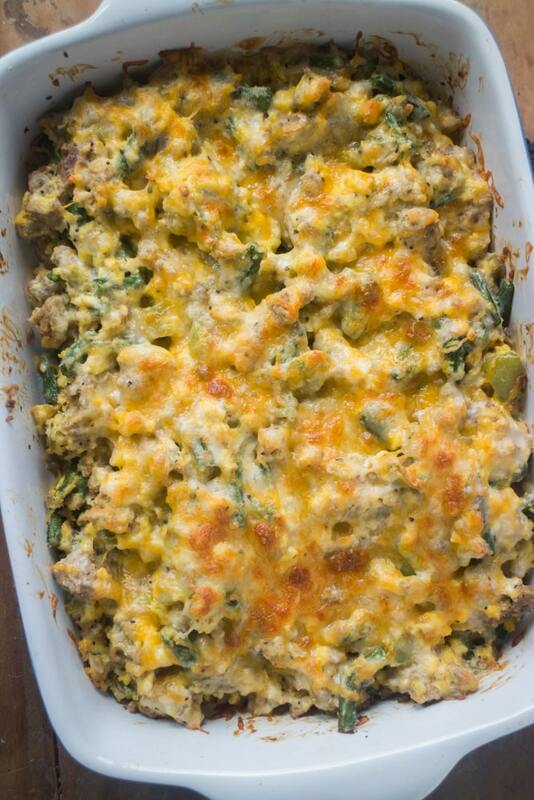 This baked casserole is low carb and you can make ahead overnight if you'd like! It's packed with vegetables and sprinkled with cheddar cheese! Add ground beef, green pepper and green beans to pan. Cook over medium high heat until beef is browned. Add eggs to pan and cook until scrambled and no longer runny, about 5 minutes. Add salt and pepper to taste. 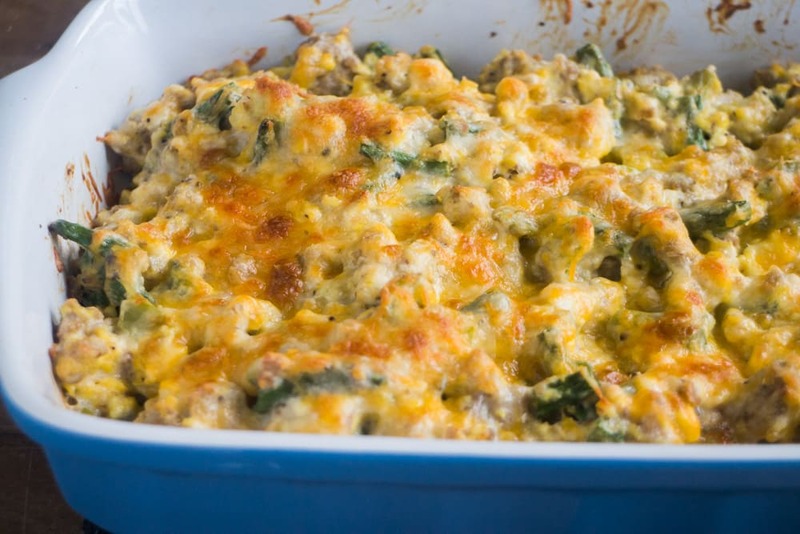 Add ground beef mixture to a medium sized casserole dish. Add cream of mushroom soup and stir to combine. Sprinkle shredded cheddar cheese on top of the casserole. Bake for 20 minutes. After 20 minutes, turn oven to broil and bake (while watching it) for 2-3 minutes, or until cheese is lightly browned. Put all your ingredients except mushrooms in a food processor and pulse until it's smooth. Add your mushrooms to food processor and pulse a couple times to chop them up. Pour mushroom mixture into a saucepan on the stove. Bring to a boil then lower the heat to simmer for 10 minutes. Is one cup of green beans correct? It looks like more in the picture. If I were to substitute spinach instead of green beans, would it be 1 cup or more? I am on a high protein diet. This recipe seems to fit the bill. Hey Jerry, one cup of green beans is correct. If you are going to substitute it with spinach, use 1 cup packed spinach. Enjoy the casserole! Thanks for answering my question. The casserole was so good. This will definitely be made again and again! Thanks for reporting back Jerry, so happy you liked the casserole! Oh I so messed this up! I did everything but when I baked it I covered it. It was like boiled soup when I pulled it out. Nothing like your picture. So now I have it uncovered in the oven hopeing to save it some how. I will give it another try though cause it sounds so good. Guess I’m one of those that needs everything spelled out for her. Keep up your good work! My mother-in-law will love this! 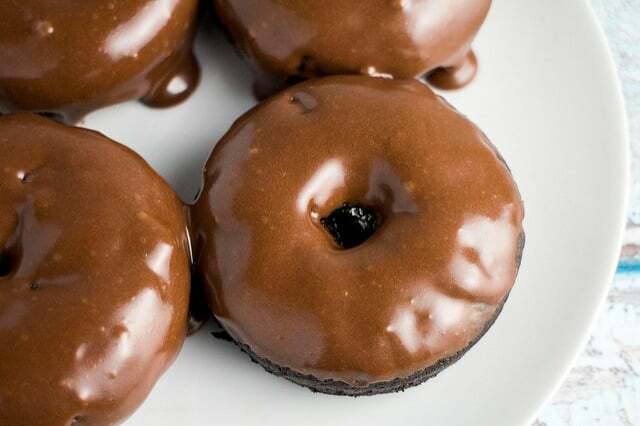 So comforting and delicious! Thank you for sharing at Fiesta Friday! what kind of pepper do you use ? You can use a bell or anaheim pepper. I wouldn’t use anything too spicy for this dish. Enjoy!